Weed management issues continue to be the biggest agronomic challenge facing US Farmers. It's an issue that needs to be approached with a consistent and economical approach, each growing season. This site will showcase progressive corn and soybean growers working with Syngenta weed specialists to highlight the management, technology and agronomic practices growers use to fight weed resistance and helping them obtain a higher level of production. Weed size matters when competing with herbicide resistance. Editor's Note: This is the second story in the Tackle Resistance series to help farmers better understand how to manage herbicide resistance. After glyphosate-resistant crops were introduced in the late 1990s, growers could make postemergence applications of glyphosate with little regard for weed size. For many, residual herbicidesâ€”the anchors of weed-control programsâ€”quickly became a practice of the past. But, when glyphosate-resistant weeds started spreading in the early 2000s, weed control became markedly more complex. Producers, many for the first time in their farming careers, had to start watching weed size closer than ever. Resistant weeds taller than a 7.5-ounce soda can become difficult, if not impossible, to control. Postemergence applications suddenly required more precision to be effective. Rates had to be right, application timings perfect. Adding even more pressure to weed control, resistant weeds germinating after the season could either go to seed or grow to an unmanageable size by the following spring. As Tennessee Extension weed scientist Larry Steckel says of the new weed-control paradigm, "There isn't an easy button anymore." To shore up mounting weaknesses in postemergence programs, weed scientists now urge producers to overlap or layer residual herbicides during the season, use multiple, effective modes of action and carefully scout for resistant weeds popping out of the soil. "Once you have a 4-inch size horseweed (marestail) in your soybeans, it becomes a major limiting factor," stresses Bryan Young, weed scientist with Purdue University. "If it's ALS resistant, we don't have those herbicides to use on it. If you're in a glyphosate system, you don't have an option unless you go to dicamba- or glufosinate-tolerant soybeans." "Once they get some heat, a lot of these weeds can grow an inch or two a day," adds Dave Johnson, product development manager for soybean herbicides and traits at DuPont. "Any problem with wind, rain or equipment can set you back even further." Spraying a resistant weed taller than 4 inches is an open invitation to resistance development, Young says. "A sublethal dose occurs by either applying a low rate on the right-sized weed or a full rate on a weed that is too big. If you apply a herbicide at a sublethal dose, and the weed survives and produces seed, there is the potential for resistance evolution to occur. It's not going to happen overnight, but there is some amount of selection pressure on that species." Johnson urges producers to not cut rates to reduce the costs on postemergence applications. "If you have a dense weed population, consider increasing the volume of water. It's going to be critical to get coverage." START CLEAN TO PRESERVE YIELD. An equally compelling reason to control weeds early comes from a study by Eric Page, currently a research scientist with Agriculture and Agri-Food Canada. The study shows weeds can reduce yield potential in corn even before they begin competing with the crop for nutrients, water and sun, says Page, who, at the time of the study, was at the University of Guelph, in Canada. "The corn plant is living off its seed reserves up until the fourth or fifth leaf tip," Page explains. "But, when weeds are present, we see competitive effects before that, including the corn plant lengthening its leaves to shade out its competitor. There is also a reduction in the amount of roots put down and a reduction in the rate of crop development." Corn is much more sensitive to early-season weed competition than soybeans, which is why weed scientists recommend preemergence herbicides as part of any weed-control program. The most competitive weeds in corn will be about 3 to 4 inches tall when the corn reaches the V3 to V4 growth stage. Iowa State University research indicates these weeds can reduce yields by about 3 bushels per acre for every day they are left uncontrolled. For example, one foxtail plant per foot of row reduced corn yields by 7 bushels per acre, according to studies done in Iowa. Similarly, South Dakota State University research indicated weeds can reduce corn yield by approximately 1% per day about 1 week after corn and weed emergence. Fortunately, producers can do a lot better job controlling weeds early on, Page says. "We're losing the capacity to spray active ingredients for in-crop weed management because of resistance. You either manage them with preemergence herbicides where you have greater options for chemistry or early postemergence herbicides where you have greater efficacy because the weeds are smaller." In the South, Palmer amaranth and other weeds continue to emerge after harvest, making weed control a nine- to 10-month job. During these post-harvest herbicide applications, Palmer amaranth's shiftiness is on full display. "Palmer amaranth is an incredibly smart plant," says Bob Scott, weed scientist at the University of Arkansas. "When it emerges in the fall, it has a mechanism that senses short days and cooler temperatures, which sends the weed into an instant reproductive state. So, instead of being 9 feet tall with close to a million seeds, it's going to put on a small seed head. It's a very well-adapted trait for a weed to have." The same shape-shifting can take place with Palmer amaranth emerging in early spring, Scott says. "When we have a warm spell early, and Palmer comes up, it'll go reproductive when it turns cold again. When it warms up in late spring, there can be Palmer amaranth plants that are fully vegetative alongside small ones putting on seed heads." Scott notes once Palmer amaranth becomes reproductive, it's more difficult to kill with herbicides because of changes in plant metabolism. Farmers who use residual herbicides to delay the emergence of resistant weeds can take some of the pressure off their postemergence program and help with the 4-inch tall standard. "We won't run the planter unless we can spray a residual behind it," says Matthew Turner, who farms corn and soybeans in Mer Rouge, Louisiana. "If we're not going to get it sprayed before the soybeans come up, we're not planting. It really helps suppress the Palmer." In soybeans, Turner will burn down in January with 2,4-D (Group 4 mode of action), glyphosate (9) and either oxyfluorfen (14) and flumioxazin (14), or rimsulfuron (2) and thifensulfuron (2), for typical winter weeds. Where glyphosate-resistant Italian ryegrass is a problem, he applies clethodim (1), and where he has a history of yellow nutsedge, he'll add metolachlor (15). "Metolachlor really helps suppress sedges and is much cheaper than coming back with halosulfuron  during the season," he says. Turner starts planting corn at the first warm snap around the end of February or first of March. He won't be far behind with soybean planting. Following the planter in soybeans, Turner applies as many as three effective modes of action, including metribuzin (5), sulfentrazone (14) and metolachlor (15). A couple of weeks later, he applies two effective modes of action postemergence. Those applications typically include combinations of metolachlor (15), fomesafen (14) and glyphosate (9). "I really like the residual behind the planter," Turner says. "If you get metolachlor with either glyphosate or fomesafen on emerged Palmer amaranth when they're small, that's really the only way to kill them." Turner adds his current weed-control program is keeping Italian ryegrass and Palmer amaranth under control. He's aiming to keep it that way with a strong corn/soybean rotation program to introduce different modes of action to resistant weeds and by applying at least two effective modes of action in every application. "We want to combine the metolachlors with the fomesafens. We can't keep doing the same thing, or we could have the same problem we had with glyphosate-resistant crops. We still need glyphosate. But, I think more and more weeds are going to become resistant. We have to stay on top of this." This means frequent scouting, too, Turner says. "One thing about Palmer amaranth is that sometimes you may think they're not there, but they're there. You have to scout carefully and find those small ones." Overlapping residuals can reduce a lot of the risk with postemergence programs, says Dane Bowers, herbicide resistance technical product lead for Syngenta. "Apply the preemergence residual and, rather than wait for everything to come up and get to be 4 to 6 inches tall, take out the small weeds postemergence and apply a residual to keep more from emerging. That's the concept of overlapping residuals." It's also a good resistance-management practice, Bowers continues. "Today, most of our significant resistance issues come from applying postemergence herbicides. If we can use good, strong residual materials at the right rates, that's a huge help. It reduces the number of weeds we have to spray post. That reduces selection pressure and helps keep our tools viable." Conversely, postemergence programs can clean up weeds when residual programs either fail or break down, which they will invariably do, Scott explains. "You're going to have escapes and failures with your preemergence herbicides. Preemergence herbicides aren't perfect; residuals aren't perfect. With Palmer amaranth, you always need a postemergence option of some kind in your back pocket for when that system breaks down," Scott stresses. He points out residuals fail "because of inadequate or too much rain. Or, you can have a good rain and have weed seed that is underneath vegetative material or a dirt clod, or in a crack on buckshot ground." In the Midwest, waterhemp poking above the canopy in August isn't always a sign of inadequate scouting or an overreliance on postemergence control. Often, the pressure to plant compromises the producer's ability to spread labor, equipment and time over acres, says Gordon Vail, corn herbicide technical product lead for Syngenta. "The mentality is to plant everything as fast as you can and worry about herbicides later," Vail says. "You want to control horseweed or waterhemp when they're small, but you may not have enough sprayers to make timely applications. To be successful, farmers have to stop and think about when they're going to plant the crop and when they're going to spray their herbicides." In the Mid-South and other areas, some soybean producers opted for total postemergence programs to save herbicide costs in 2017. Only 50 to 60% of the soybean acres in Arkansas planted to dicamba-resistant soybeans had a preemergence down at planting, Scott says. "If producers had glyphosate-resistant weeds in those situations, they were essentially relying on a single mode of action," he says. To the surprise of Scott and other weed scientists who urge farmers to use multiple modes of action and residuals, 2017 research at the University of Arkansas indicates a total postemergence program can work effectively to control resistant weeds, "especially on drilled soybeans where we get quicker canopy closure," Scott says. "It gets a little more difficult in wide-row soybeans." Despite these findings, Scott stresses a total postemergence program "is a very bad idea. We've already shown in university research in the laboratory that you can create a dicamba-tolerant Palmer amaranth. You can create a glufosinate-tolerant Palmer amaranth. You can create a 2,4-D-resistant Palmer amaranth using lower rates and multiple applications." RESISTANT WEEDS VS. RESISTANT FARMERS. One impediment to farmers adopting weed-resistance-management concepts is the idea that resistant seeds from a neglectful neighbor can blow onto their farms, thwarting their resistance-management efforts. But, research at the University of Illinois and USDA-ARS found no link between management practices of neighboring farms. "The good thing is not only does management matter, it's what you do in your own field that matters. Even if a neighbor's resistance [weed problems] moves, it's at a small frequency. If you're doing the right thing, it will stay at a small frequency," points out Patrick Tranel, weed scientist and coauthor of the study. 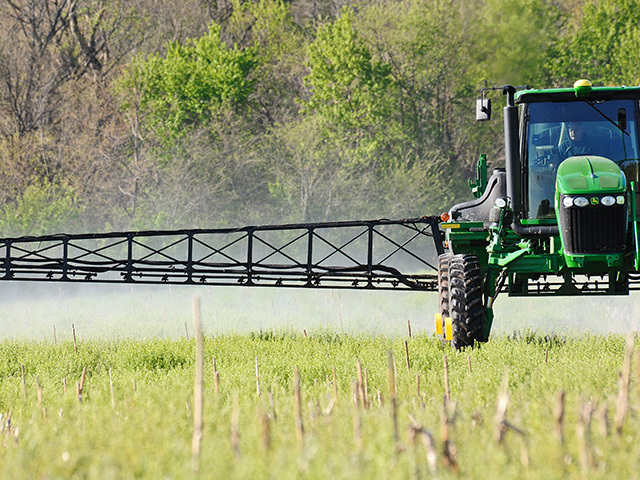 Just adding a few herbicides to your program can make a big difference, too. The study on glyphosate-resistant waterhemp found that growers who use 2.5 effective modes of action are 83 times less likely to develop resistance than farmers who use 1.5 effective modes of action. "It's pretty amazing that one additional mode of action in your tank reduces your chances of resistance by that much," Tranel points out. "Once a producer is comfortable with a management plan, he can do a good job of managing resistance," adds Belzoni, Mississippi, farmer Trey Koger. "But he can't deny he has a problem. With Palmer, you can go from a handful of weeds to a complete crop loss in three years." How can a weed native to the Sonoran Desert, which covers most of Sonora, Mexico, and the southern tips of Arizona and California, end up thriving in Michigan, Minnesota and Wisconsin? To find the answer to that question, researchers are taking a look under the hood of what is proving to be the world's most genetically diverse weed: Palmer amaranth. University of Florida researchers gathered Palmer amaranth weeds from 10 populations across Georgia and Florida from diverse cropping systems including soybean monoculture, peanut and cotton rotations, corn and crops from organic production. The scientists found that weed populations that came from crop rotations of bigger crops like corn and cotton were taller than populations from smaller crops like peanuts, soybeans and wheat. "The changes in height relative to crop size help Palmer amaranth maximize seed production within the crop, and this certainly increases its survival, especially when we are constantly attacking it with herbicides and cultivation," explains Ramon Leon, an author of the study, who is now a weed scientist at North Carolina State University. After eliminating environmental reasons for the effects, scientists concluded the differences in height were genetically determined. "This indicates that the species is quickly adapting to the management we have in agricultural fields," Leon says. Leon explains the spread of resistance "is not so much that Palmer's seeds are dispersed long distances, rather the weed is also quickly rearranging its genome and getting the genes it needs to be successful wherever it is. That tells us that genetic differences are happening at a very rapid rate." Essentially, a farmer can create his own resistant weed specifically bred to his management practices and unique to his farm. The next step for Leon is to expand research to determine what farmers are doing and not doing to favor Palmer amaranth adaptations. "We want to find farms, or states or regions, where Palmer has not been able to adapt so quickly," Leon says. "If we can, maybe we can prevent what is happening in other regions where the adaptations are taking place." DTN/The Progressive Farmer and the MyDTN suite of proprietary business management tools are transforming the agriculture industry with game-changing agricultural information solutions and market intelligence that enable farmers, agribusiness, and commodity traders to actively and effectively manage their businesses. For more information on all MyDTN services, visit www.DTN.com/agriculture. © 2002-2019 DTN. All Rights Reserved. DTN is a registered trademark and the property of DTN. All other trademarks are the properties of their respective owners.